I have mentioned that I am tart crazy lately, right? Here's another version. We had my niece and nephew over for a swim last weekend. Needed something not messy for a dessert that they can eat without getting out of the pool. My nephew's a big fan of tarts and they would also love ice cream on a hot day. 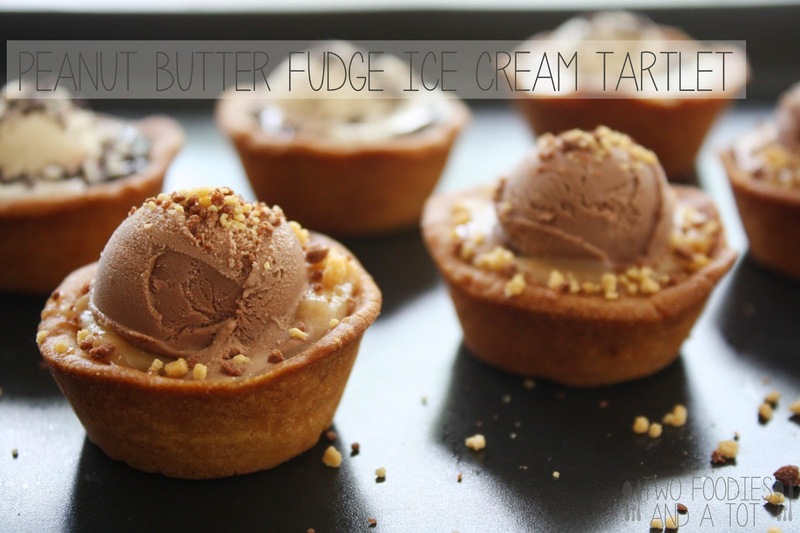 So..I thought will ice cream in tartlet work? Yep, it worked. In fact, it was a perfect dessert to eat by the pool. Pop each one in the mouth, no mess. Well, you just have to eat really fast before they melt but that wasn't a problem at all. They were all gone with a blink of an eye. =) I cut to see what it looks like inside but a lot easier to just pop the whole thing in and enjoy. In the background in the picture, you can probably see vanilla flavored ones. I used chocolate fudge, vanilla ice cream and cookies and cream sprinkles but for some reason they melted so much faster than chocolate ones, I wasn't so satisfied. I made tartlet shells with my mini muffin pan but you can totally buy a ready to fill type if you want to make it even easier. I have my favorite chocolate ice cream recipe I'd like to share soon but I used store bought chocolate ice cream this time. 1. 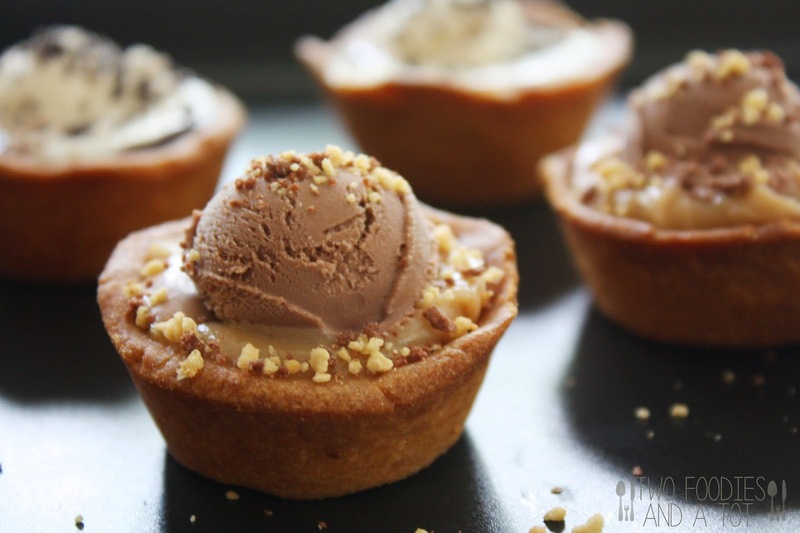 Make the tartlet shell- Pulse all the ingredients in a food processor and make a dough. Make them into little balls and place in a mini muffin pan. Mine made 16 of them. Using back of a melon scoop or your fingers press it down so it makes the shell shape. Prick each bottom with a fork and place the muffin pan in the freezer for 15 minutes. Bake at 350F for 30-40 minutes or until golden brown. 2. 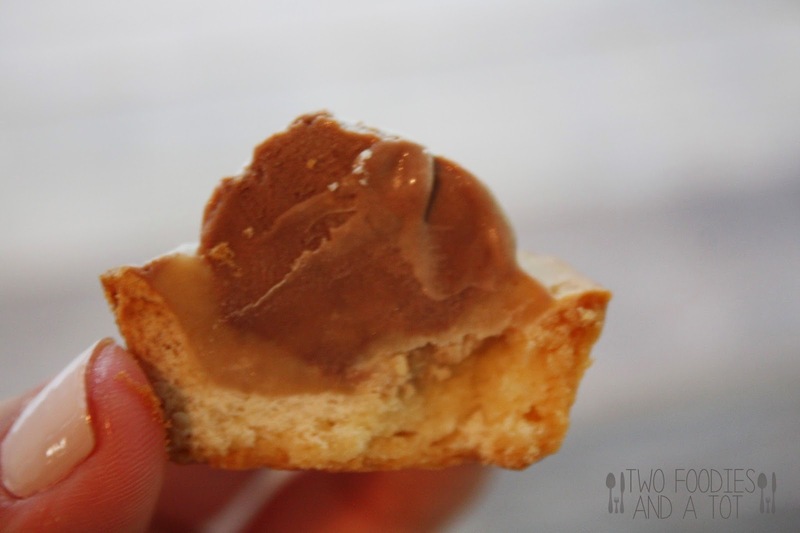 In a small sauce pan, add all PB fudge ingredients except peanut butter. Bring it to a gentle boil and simmer for 5 minutes or so to thicken it a little bit. Remove from the heat, add peanut butter and stir until smooth. Let it cool. It gets a little thicker as it cools. 3. Place a dollop of fudge in each cooled shell. Using a 1/2 Tbsp ice cream scoop, place a small scoop of ice cream on top of the fudge for the smooth look, if not using 1/2 Tbsp scoop, you can go for a rustic look and put a dollop of ice cream using a regular spoon. 4. Top with your choice of sprinkle. Serve immediately or keep in the freezer and take it out of the freezer just a few minutes before serving.